Depicted is the richly ornate Nave or Katholikon of the Church of the Holy Sepulchre, also called the Church of the Resurrection. A curious votive vase which for many of the pilgrims was placed at the exact 'Navel of the world.' is seen in the centre. 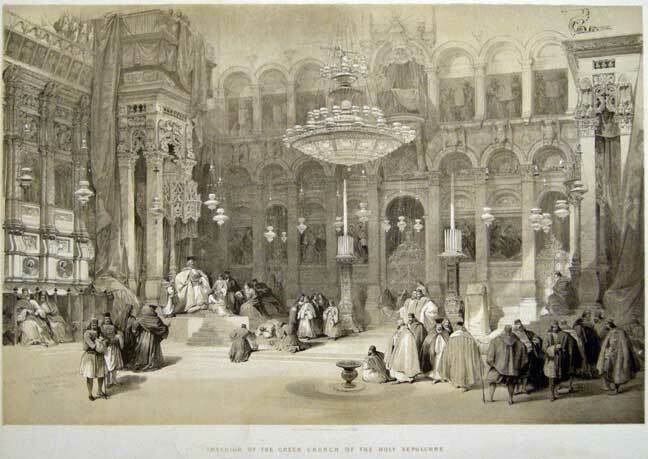 Roberts visited and sketched the Greek Church during Easter week and was witness to the richly adorned Palm Sunday processions.